Uncategorized | September 15, 2015 | by Missy Pfohl Smith. I am proud of this work, and humbled by the generosity and depth of the work of the artists involved in this show. 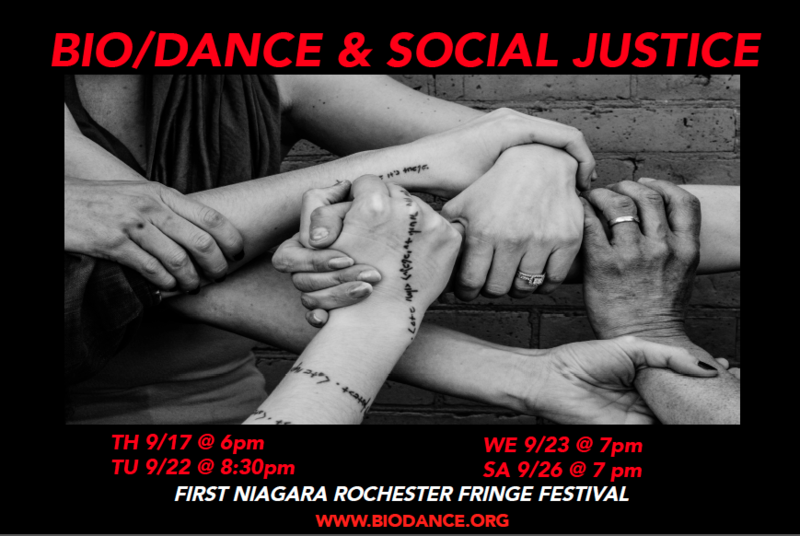 BIO/DANCE & Social Justice is a collection of work that brings various reflections and diverse perspectives of inequality in society today. 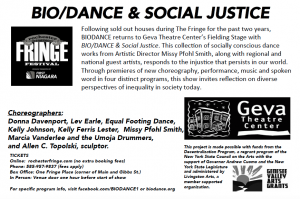 Following sold out houses during The Rochester Fringe Festival for the past two years, BIODANCE returns to Geva Theatre Center Center’s Fielding Stage, featuring all new premieres of choreography, performance, music and sculpture in four different programs. Drew Bellavia, Sarah Canny, Wayne Cleveland, Jeanne Schickler Compisi, Kathleen Dalton, Donna Davenport, Maureen Gorman, Maureen Gorman, Kelly Johnson, Sarah Morell Johnson, Kelly Ferris Lester, Alaina Olivieri, Laura Regna, Julie Schlafer Rosette, Elizabeth Strano, Ashley De Los Santos, Becky Geisinger, Khalid Saleem, Stuart Tsubota, Marcia Vanderlee, Phil Vanderlee, Ashley Owen, Tina Green, Isaiah Harris, Rachel Vinciguerra, Kaitley Wozer. Sept. 17 Program includes work by Donna Davenport, Kelly Johnson (Tiger Lily), Missy Pfohl Smith, Kelly Ferris Lester and Allen C. Topolski. Sept. 22 Program includes work by Donna Davenport, Lev Earle, Kelly Johnson (Tiger Lily), Missy Pfohl Smith, Marcia Vanderlee, Khalid A. N. Saleem and Allen C. Topolski. Sept. 23 Program includes work by Donna Davenport, Lev Earle, Kelly Johnson (Tiger Lily), Missy Pfohl Smith, and Allen C. Topolski. Sept. 26 Program includes work by work by Donna Davenport, Equal Footing Dance, Kelly Johnson (Tiger Lily), Missy Pfohl Smith, Marcia Vanderlee and Khalid Saleem, and Allen C. Topolski. BIODANCE kicks off The First Niagara Rochester Fringe Festival in Headliner Show with Grounded Aerial! Emotionally charged choreography. Amplified in mid-air. Ready for a visceral, innovative combination of modern dance and uniquely rigged aerial elements with jaw-dropping moments? A theatrical performance of mind-and-body-bending choreography and vibrant interactive characters, Grounded Aerial uses the dimensions of each performance space to craft site-specific dynamic shows never to be duplicated anywhere else. 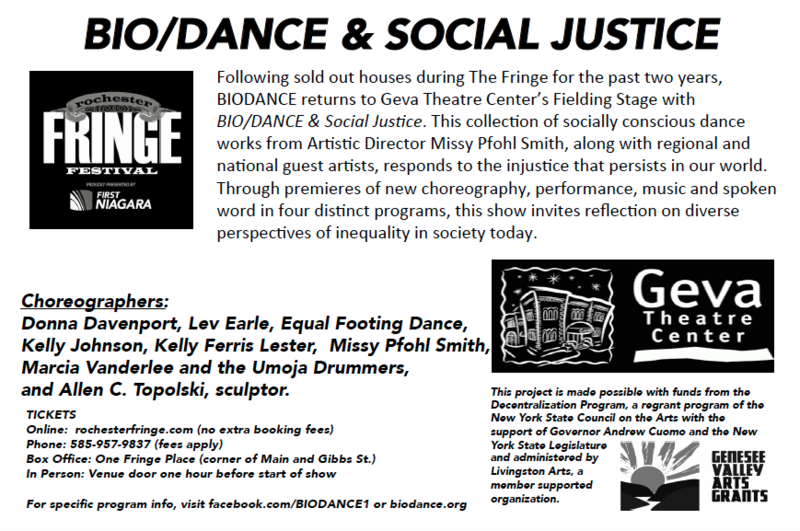 BIODANCE joins them on “A Tribute to Man,” the sculpture installation in Martin Luther King Jr. Park in Manhattan Square. A new breathtaking high is coming. Look up, Rochester. How to Best Enjoy: Bring a blanket or lawn chair. Food trucks will be there! 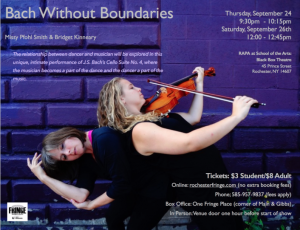 BIODANCE Artistic Director Missy Pfohl Smith joins violist extraordinaire Bridget Kinneary in Bach without Boundaries, a premiere work that explores the relationship between dancer and musician. In Person: Venue door one hour before start of show.